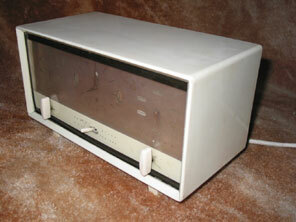 Ekco Radio Continued, Model A33 "Radiotime"
Shown here is the Ekco A33 "Radiotime", which cost £24.3.0+pt when released. 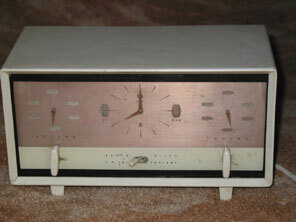 This was the first time Ekco had made a clock radio, and looking at the angular white cabinet it is difficult to believe it was made as early as 1947. The reason that it looks so good is because Ekco had again engaged a well known architect to design the cabinet. The cabinet was designed by Wells Coates, who had of course designed the concept of the round radio cabinet as early as 1934. The A33 cabinet features exceptionally clean lines, and a true white cabinet. It is a world away from the other clock radio made by Goblin on offer in 1947, click here for pictures and further details. The radio itself is reasonably compact, and could comfortably fit on a bedside table unlike its competitor from Goblin. However the small size of the case results in compromises being made, chief of which is that the radio has no manual tuning. Instead six programmable stations are provided, which are selectable by the right hand large knob, and are indicated by a cursor in the same style as the clock hands.. The left had knob selects the volume, and although it is a continuously variable potentiometer, the facia of the set suggests it is a switch since it features six rather unlikely volumes settings of Off, On, Low, Med, High, Full, also indicated by a clock hand type cursor. This has been done purely so that the set looks symmetrical from the front, apparently contradicting the beliefs of Wells Coates who said function should determine the appearance of an item. The lever in the centre can set the receiver either to timed or manual operation. Alternatively a toggle switch at the back of the receiver can set the radio to sound a tone alarm instead of a radio station if required when the alarm triggers. In the event that a transmission fails the receiver will sound the tone alarm in its place, the tone alarm being generated by the EF39 utilised as an oscillator. Full valve line up is EF39, ECH35, EBL21, EZ35. Continue to find out how the A33 Radiotime Clock determines when the radio should switch on and off.